The Veteran information cards, donor cards and general information sheet regarding the Springfield Veterans Memorial are now available by contacting Jim Hornstra at 369-5555 or springvetmem@yahoo.com. The forms can be filled out on line and returned via email for those wishing to do so. At their June 13 meeting the Springfield Veterans Memorial Committee made plans for future fund-raising opportunities. The committee will be serving the lunch at three golf tournaments this summer - July 16, July 23, and September 8. Connie Allen is coordinating these fund-raising efforts. Members of the community who would like to help out by providing food for these should contact Connie at 369-2840. Information about the memorial and donation solicitation will take place during the Springfield 4th of July celebration. Local organizations are being asked to consider hosting fundraising events for the memorial. The construction of this tribute to our veterans is a community project that will take the support and efforts of the current and former members of our community. The Springfield Veterans Memorial Committee is seeking photos from all eras of service for the memorial and dedication booklet. The type of the photos we are looking for are "action" photos rather than formal military photos. This would include photos of personnel with military vehicles, scenes from overseas and state-side service and other venues that depict the time of service. We are also asking that submitters include a description of the photo which can be used in the booklet. To submit a photo and description for the committee to consider for inclusion on the memorial and/or in the booklet, please send to Carol Hagen, PO Box 629, Springfield SD 57062. You can also email photos (as attachments) and descriptions to springvetmem@yahoo.com. Please include your return name and address if you want the committee to send back the photos. You should consider sending us a copy of the photo rather than the original photo itself. 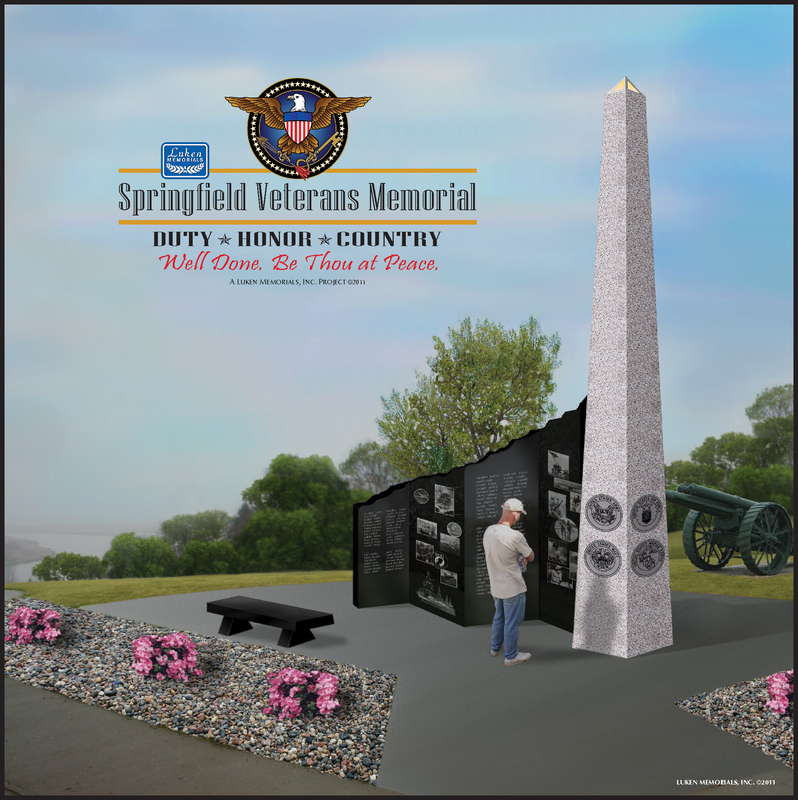 The Springfield Veterans Memorial Committee has selected a proposed site for the location of the memorial. The area located immediately to the west of the picnic shelter at Terrace Park is the chosen site. Representatives of the committee appeared before the Springfield City Council at the February 7 council meeting requesting approval for the use of the site. At that time the council requested that the committee provide a design for the memorial before granting approval. At the March 28 meeting the committee met to discuss the design with Bob & Scott Luken of Luken Memorial Inc. of Yankton. Luken Memorial will continue to work on the design and will bring an updated design sketch to the next meeting of the committee which is scheduled for April 28. A meeting to acquaint the public with the project will be scheduled once the committee is able to present the design to the Springfield City Council and has approval to use the Terrace Park site for the Memorial. Search Underway- Can you Help? As part of the memorial planning process, the Springfield Veterans Memorial Committee is trying to locate the WWII Veterans Memorial plaque that was last seen at the south end of the football field located at the college. After contacting several individuals the committee has come up empty-handed and is asking for help from the Springfield community. If you know of the where-abouts of this plaque, would you please take a minute to contact one of the committee members - Connie Allen, Mel Ludens, Jim Hornstra, Melroy Hofer, Dr. Nolan Carson, Bob Bussey, Don Irish, Chris Libis or Carol Hagen. Many southeast South Dakota employers will be available at the veterans and spouses job fair Wednesday, November 16 from 10 a.m. to 2 p.m. at the South Dakota National Guard Armory, 1204 W. 31st Street, Yankton. The event is co-hosted by South Dakota Department of Labor and Regulation, Yankton's Charlie Battery, First Battalion, 147th Field Artillery and VFW Post 791 Auxiliary.